I am obsessed with antique letterpress type. I first became interested in college while sitting through one of my graphic design history classes. They used to hand place these moveable-type blocks in printing presses to create newspapers, books, posters, etc. I started buying and selling the type for my online Etsy store and it ended up all over my house, too. The two most common types of letterpress are wood and metal (a lead alloy). The metal is very heavy and it is rare to see metal type larger than 72pt (1 inch tall). 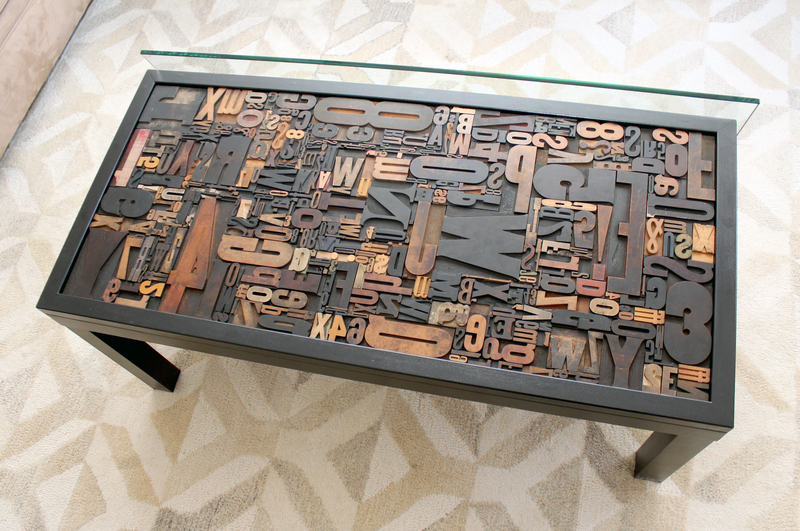 I’ve seen wood type range in size from 1 inch to 12 inches tall. All type has the same depth of .918 inches. 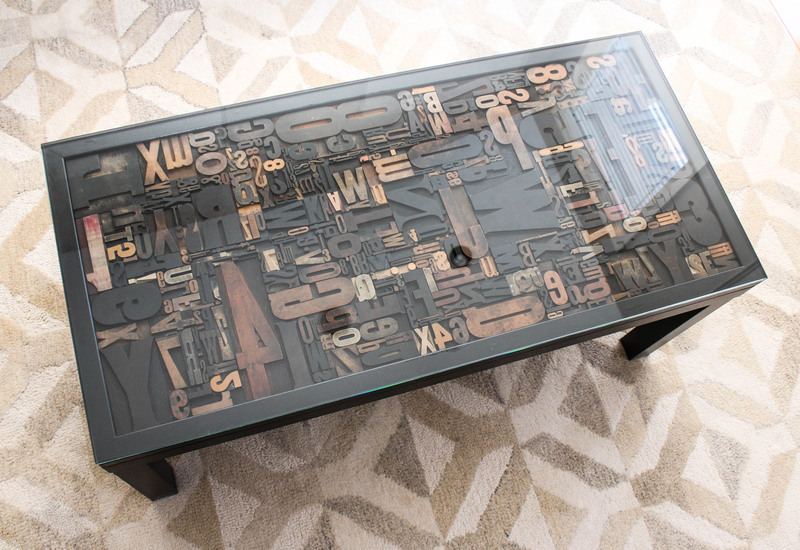 I wanted to make a wooden letterpress coffee table and knew I needed a LOT of type. I found a guy in Owosso, MI who has cabinets and cabinets full of the stuff. We took a road trip to meet him and I came home with a box full. 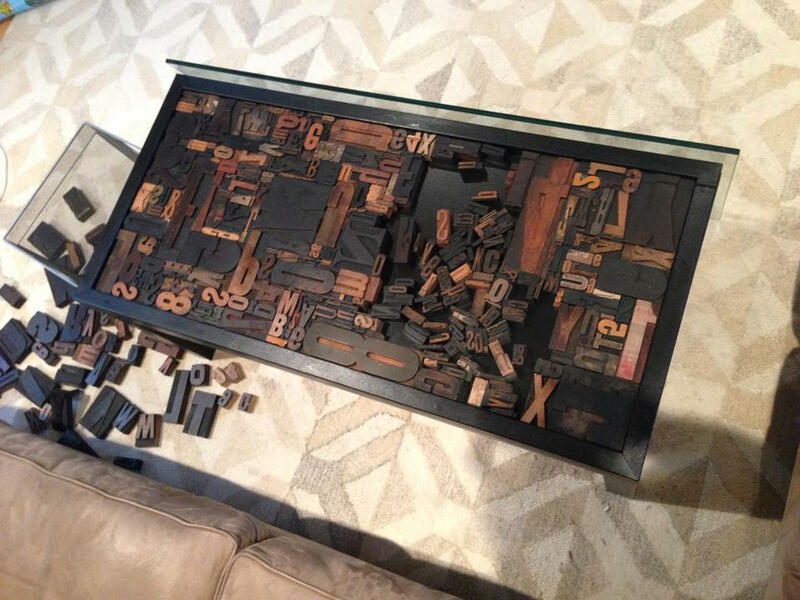 Wooden letterpress type is not cheap. It typically sells between $2-3 dollars per inch, so a 4 inch tall block might run you $12.00. I ended up getting a good deal with the Owosso guy because I purchased a letterpress cabinet, 20 trays, and a ton of type. I bought a basic coffee table and made a wooden frame to nail into the top and painted it to match the rest of the table. Then the fun part came of putting this giant puzzle together. It took months and several visits with my sister who loves puzzles to complete. I just fit the type in snuggly, I did not glue anything. I bought a custom glass top from Dulles Glass & Mirror. I have bought several glass tops from them and they are the cheapest I’ve found online, good quality, and always packaged and shipped so well. This is seriously amazing! Wow, well done! I love these, having used letterpress type ages ago at Art School in the UK. My son is making me one, but any suggestions how you secure the glass top please? The glass I used is 1/4″ thick and quite heavy, so all I used are those little clear round flat circular bumpers on all 4 corners to prevent sliding.